Saturday night we had dinner at Morton’s Steakhouse. 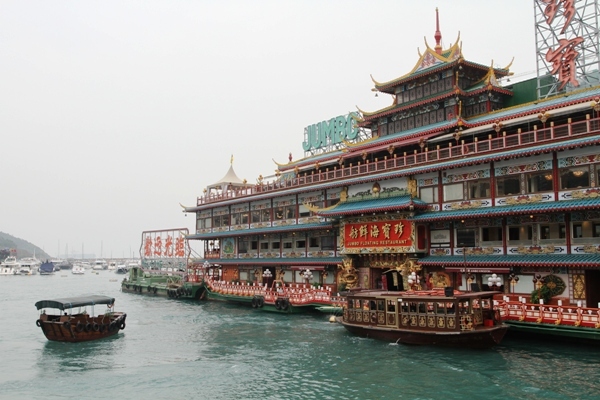 The restaurant is on the 4th floor of the Sheraton in the Tsim Tsa Tsui district in Kowloon. The dinner was very very expensive, but oh so good. I had beef fillet and asparagus and we shared a crème brûlée for dessert. 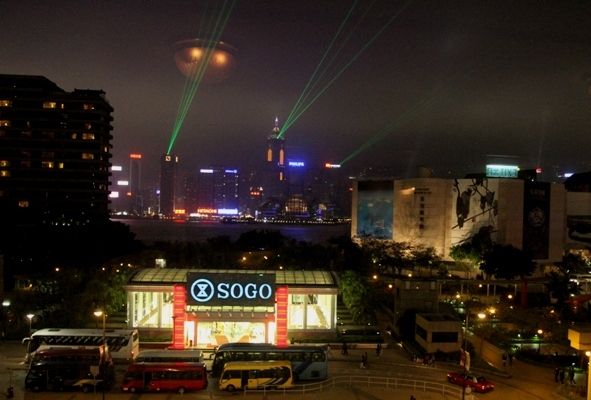 We could also check out the nightly 8pm laser show from the Hong Kong Island buildings (picture). I have no idea how they synchronize the laser beams from three different buildings. Sogo in the foreground is a very nice Japan-based department store. Next pictures : tiger lily (I think) from Flower Market Street; green parrot or parakeet working its charms with the on-lookers at the Yuen Po Street Bird Garden; entrance to the Hong Kong Museum of Art; painted gray pottery horse from the Han dynasty 206 BC; reflection picture inside the museum; larger-than-life dolls in a store in the Woodlands designer boutique mall in Tsim Tsa Tsui district; scene inside the Mass Transit Railway system – lots of people, internet users can use Google unfiltered in Hong Kong, and a family tending their toddler; electronic bill-board for new Sony-Ericsson phone with 8 Mp camera. Tomorrow is a holiday, so we will just head back to Dameisha in the morning and prepare for Tuesday’s work sessions. Then there’s Wednesday, and Thursday I get to go home. It feels like a very long time since I’ve been home ! 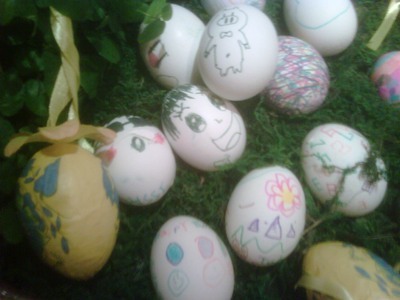 I hope everyone is having a great Easter weekend. We’re in Hong Kong and I’m running out to join my two mates from work to go out. 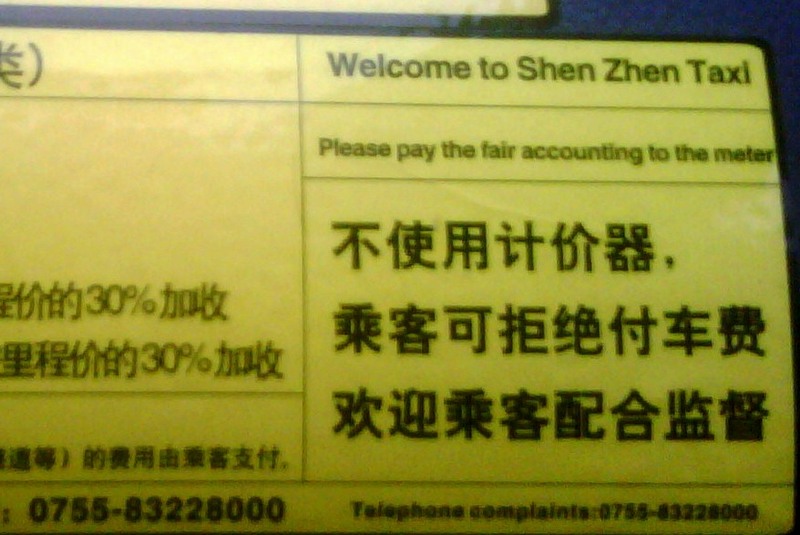 I suspect ‘Please pay the fair accounting to the meter’ should have been ‘Please pay the fare according to the meter’. 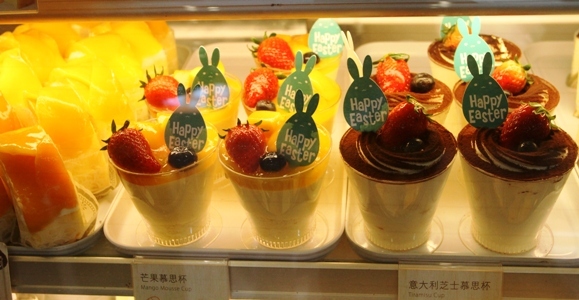 The other two pictures : Easter eggs decorated by kids from the hotel restaurant, some goodies from a Hong Kong 7-11. So I was the April fool last night, discovering at my apartment door I lost the key somehow. The duplicate key is in Texas USA, David that has the apartment manager’s phone number was on an airplane to Shanghai, and I cannot speak Chinese .. those all dawned on me as I explored my options. Then I recalled something fell out of my pocket on the bus in the morning; I was half asleep and didn’t pay attention to it. And luckily our bus-driver could still be reached since the late bus was on his way back to the office. I take the early bus in and the early bus back. We are not allowed to take the late bus in and the early bus back! (Well we are, but we shouldn’t do it as a rule). In the meantime I walked down to the world’s most famous/infamous fast food franchise for a grilled chicken sandwich. The sandwich, ten chicken nuggets, a cup of corn and an orange juice went for ¥41 (about US$7). That is expensive by Chinese standards : our dinner the previous night with shared vegetables, two meat dishes and rice with a beer each was about the same. 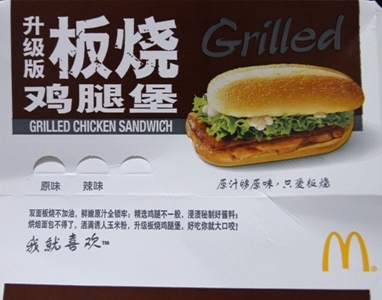 The first picture is of the side panel of the sandwich box. I would love to know what the chicken says (eat me?) but it’s too hard to put the characters into my translator. 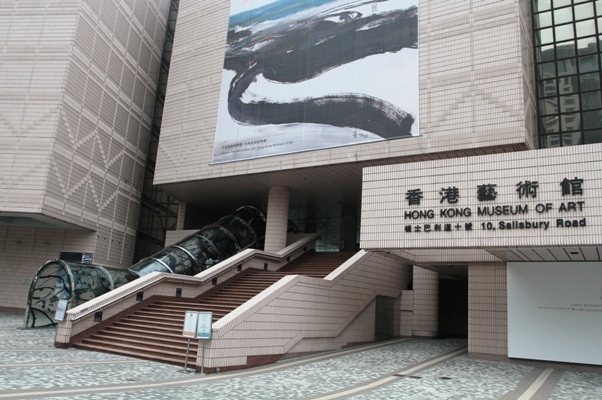 Monday is a national Chinese holiday, and we don’t have to come to work, so I’m going to my favorite Asian city (Hong Kong, of course) to show my former roommates around Kowloon a little. The little bite-size sweet bread desserts – only unglazed ones were left on the plate by the time I realized I wanted a picture! 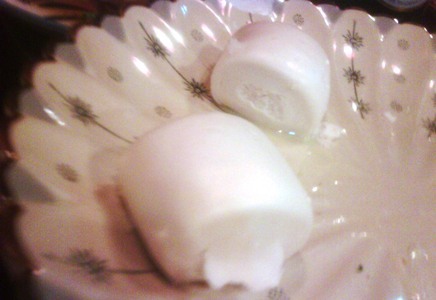 – are from last night’s dinner, and were delicious. 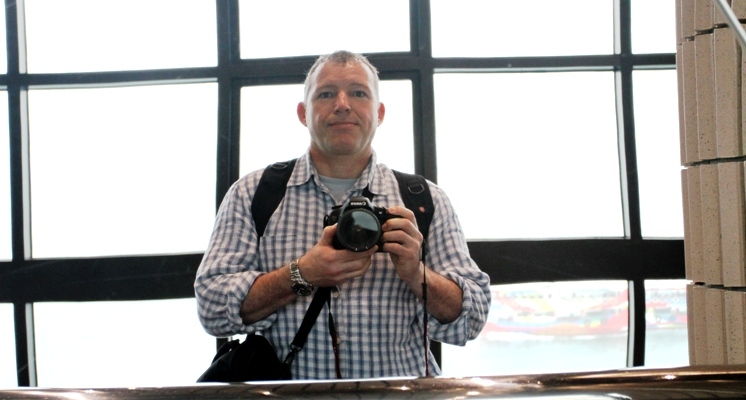 Nick, our American colleague that speaks fluent Chinese (!, how did you learn the language? we ask him), ordered them for us. 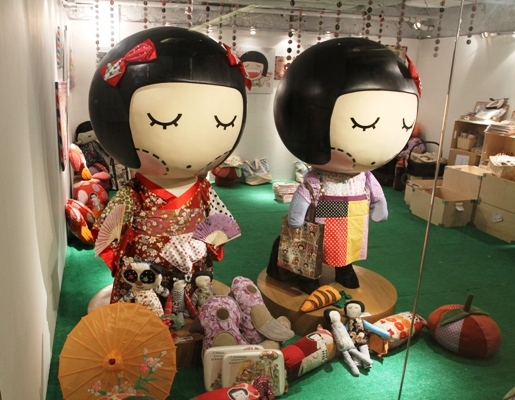 I will get the Chinese name for them. 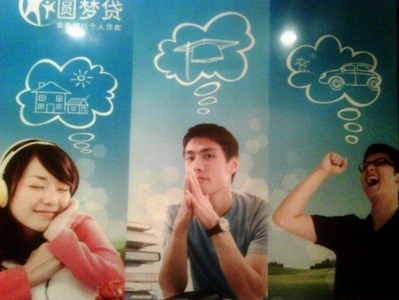 The next picture is from inside the elevator in the apartment building – a bank advertisement : dreaming of a house, an education, a car? I am very lucky since I have all three. I can now dream of different things. The final picture I snapped this morning while waiting for the bus. A very typical foggy morning .. maybe it will go away as we move toward summer. I always feel that if I can just survive Wednesday, the work week dragon is slain. The current phase in our project – high-level blueprinting – is drawing to a close. So we have the rooms in the SAP house, and the basement and the roof. Up next is the detail blueprinting : filling in the positions of the furniture, the fixtures and the floor layouts. For example : we know what kinds of work will be done with a work order, but we have to design the layout of the printed work order, its codes, its possible statuses (and there are many! more than 20) and if the standard SAP screen fields need to be tweaked. The friendly dragon is from Max and Mei’s Activity Book. 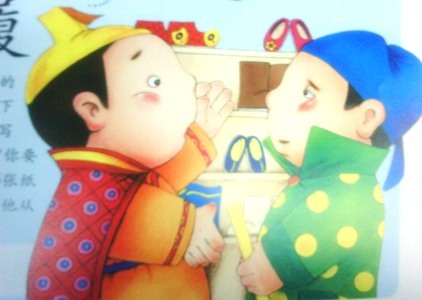 Don’t laugh – if it can teach Chinese kids to count, it can teach me too! Hint : Double click on the picture to enlarge it and look for the characters for 1, 2 and 3. Those are easy to spot. 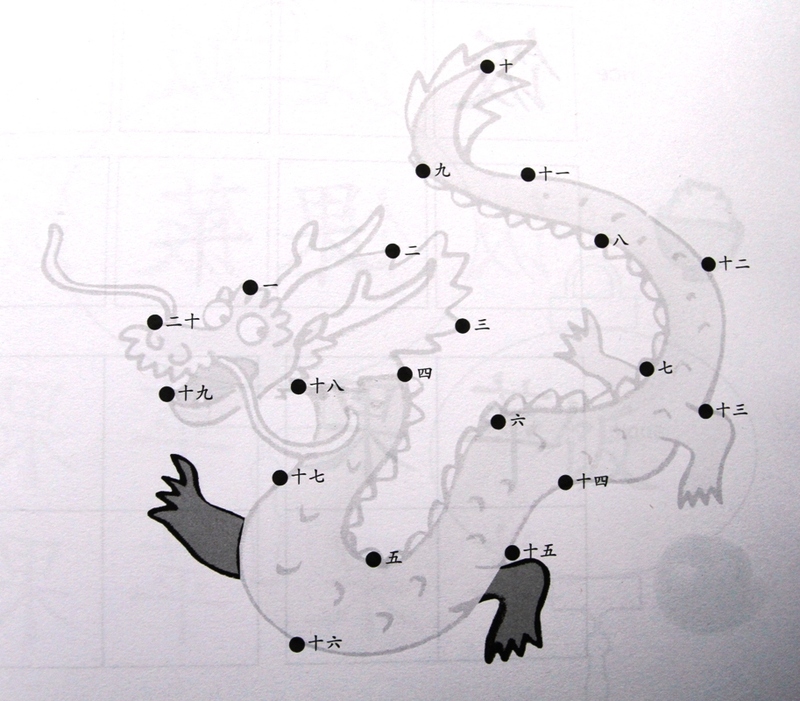 Then follow the dragon’s outline from there to get all the others to 20 as well ! 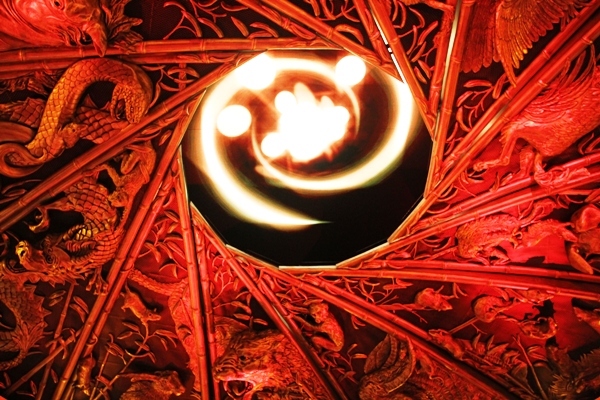 And is there a symbol for zero in Chinese? Yes, but it is a 13-stroke character 零. Many, many Chinese eat rice at every meal, and for breakfast it could be a slurry of ground- up rice. But I – growing up on Kellogg’s Corn Flakes, South African Pronutro and my all-time favorite : when mom made Maizena with cinnamon sugar for a special treat- I still want my cereal for breakfast. 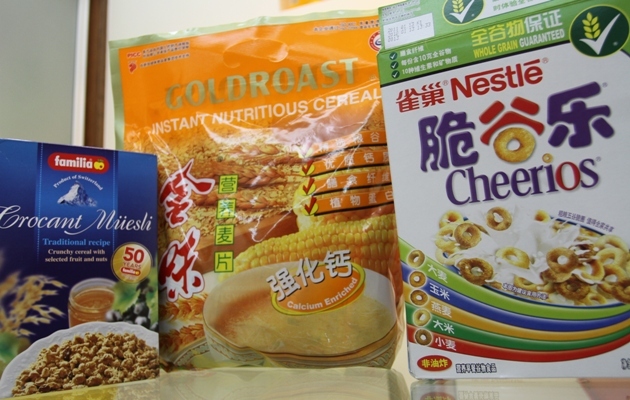 The box of Cheerios in the picture, made by the giant food corporation General Mills in the USA, is interestingly marketed by arch-rival Nestlé in China. The explanation is that General Mills operates internationally mainly through joint ventures. 脆 is crisp, 谷 is grain or corn and 乐 is .. wait for it! .. happy! yes! Cheerios are crispy and makes me happy in the morning. I will try the muesli from Switzerland tomorrow, and the local product Goldroast ‘instant nutritious cereal’ when I have run out of the other stuff. 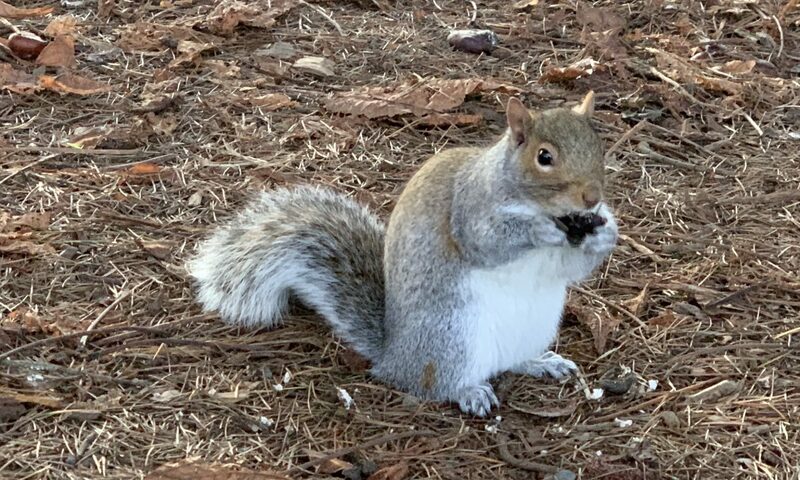 Finally, it’s a little obscure, the connection, but the ‘Breakfast in China’ title of today’s post reminds me of the song from Supertramp’s ‘Breakfast in America’ (1979). I can hear the song in my head now! Take a look at my girlfriend/ she’s the only one I got/ not much of a girlfriend/ never seem to get a lot/ take a Jumbo, across the water/ like to see America/ see the girls in California/ I’m hoping it’s going to come true/ but there’s not a lot I can do/ could we have kippers for breakfast/ mummy dear, mummy dear/ they got to have ’em in Texas/’cos everyone’s a millionaire .. The first picture is of the apartment’s Chinese Whirlpool washing machine. 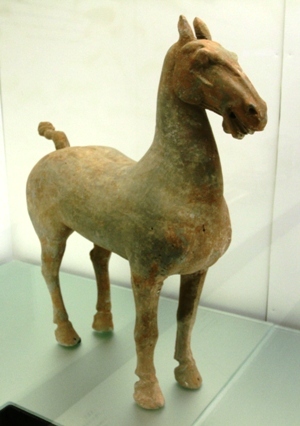 (I used the picture to get a translation from my Chinese colleagues at work). The toggle button on the left with the three little elliptical indicators is for the size of the load, small medium or large. The button on the right translates into classic washing terms as follows, clockwise : water only = rinse only , wash/ purge/ clean = wash cycle, remove soap = rinse cycle and to shrink the water = spin cycle! Then there’s the >|| Start/ Resume button which needs no translation. The next picture shows the middle of the three levels (see the way my shirt and shorts match the sofa’s colors? a coincidence, I assure you); the bedroom and bathroom is behind me, and the small kitchen and dining room is a level below by the front door. 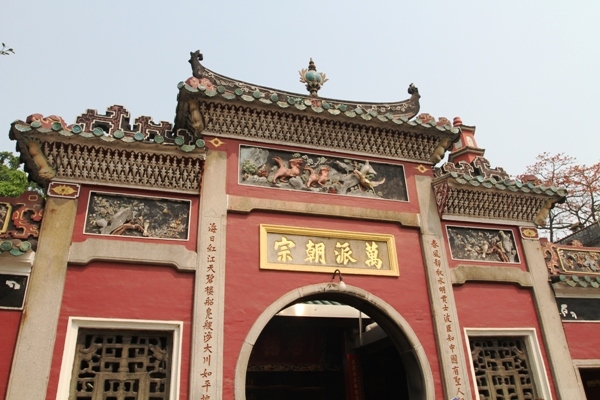 The final picture is of the courtyard. Lot of green with twittering birds in the morning when I cross it to get out the gate where the bus picks us up. The swimming pool (blue in the picture) is still dry. Maybe they will fill it up for summer. 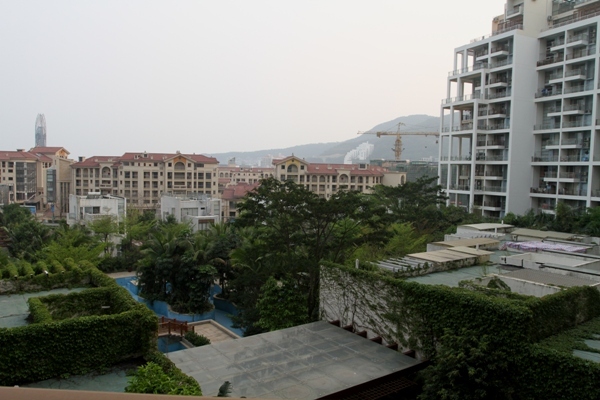 The ugly tower from the Dameisha beach is just visible over the rooftops on the left. 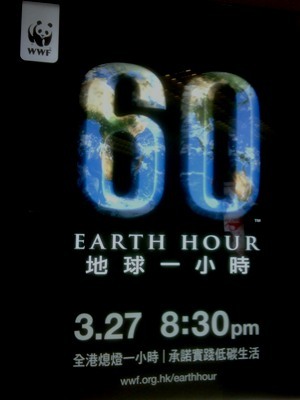 So .. did everyone turn off a few lights for Earth Hour 2010 (picture taken in the HK subway)? I did, in my hotel room in Hong Kong : ). I see Samoa and New Zealand is playing in the final of the Hong Kong Sevens tournament. 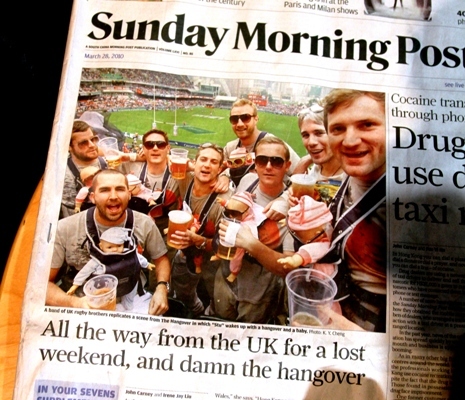 Below is a picture from the Sunday Morning Post in HK – it was evident already England wouldn’t make it, but the group of fans seemed to have enjoyed themselves nonetheless. These guys all dressed up as Stu from the movie The Hangover – yes, those are not real babies strapped onto them ! 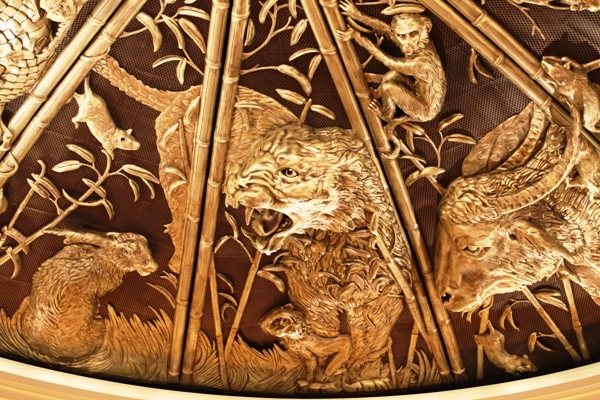 .. Stu wakes up with a baby in the room, and I think there is a tiger in the living room. I still have to see the movie. This morning at breakfast in the hotel there was another group of guys dressed as Captain Kirk from Star Trek (or so I thought! and I couldn’t quite place where the British accent they had was from). 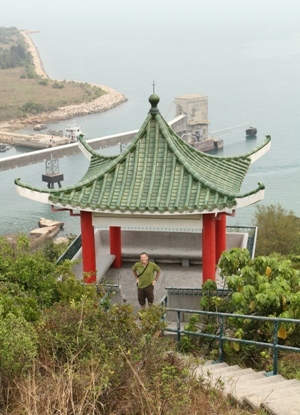 Lamma Island (traditional Chinese: 南丫島) is the third largest island in Hong Kong and part of the Islands District, Hong Kong. 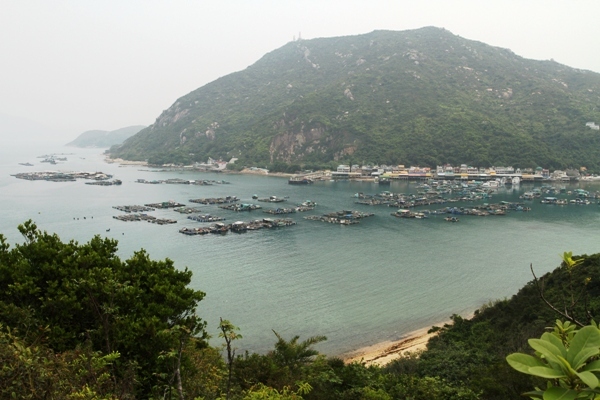 It is southwest of Hong Kong Island, only 13.5 sq km (5 sq miles) with an estimated population of 6,000. 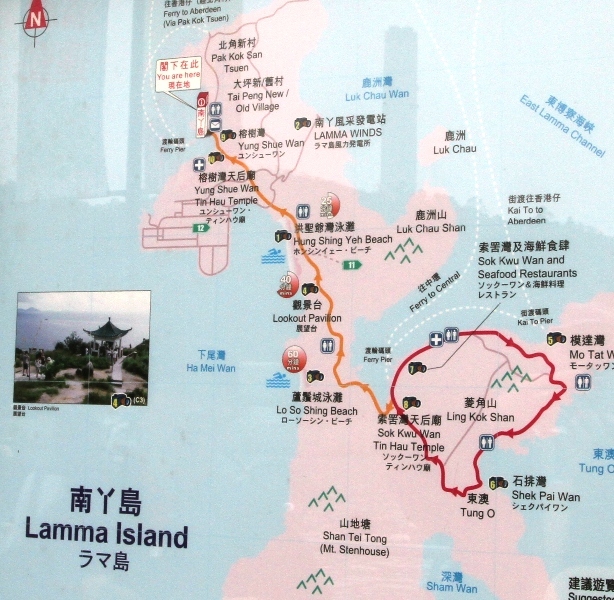 Lamma is, in contrast to Hong Kong Island and Kowloon!, peaceful and tranquil, with relatively natural scenery. 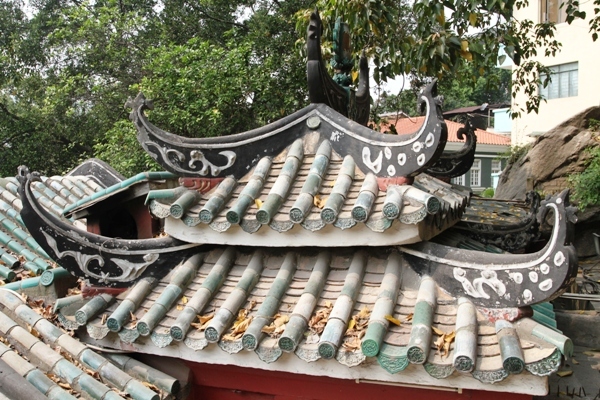 Buildings higher than three storeys are prohibited and there are no automobiles, but diminutive fire trucks and ambulances, as well as distinctive open-back vehicles to transport construction materials. The community’s only transport means is by foot or bicycle. 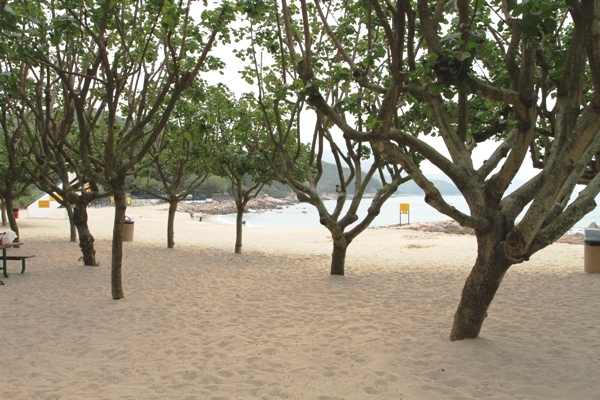 Lamma provides an alternative to the hectic life in the city. 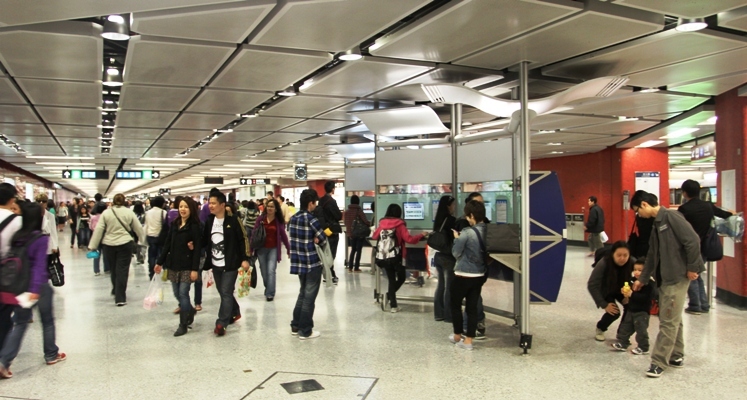 Property and rents are cheap compared with those of central Hong Kong. We arrived at the north-end with a chartered boat, and walked down the orange trail on the second picture (an hour and thirty minutes) to the Rainbow Seafood Restaurant. The seafood part of our lunch was fished out of the tanks; we also had noodles and beer and all in all it made a nice meal. I did not try the sea snails with garlice and crab. 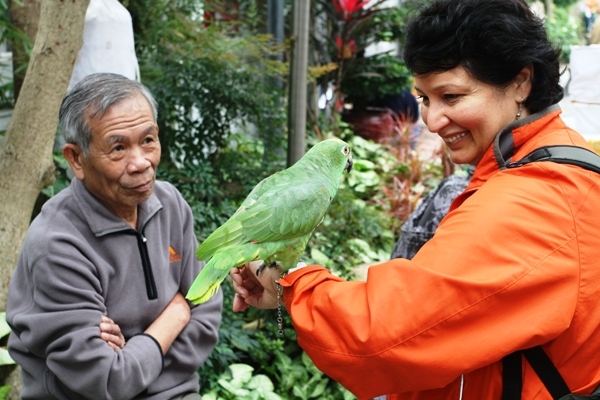 The pictures : Lamma Island is marked with A; the orange trail is nicely paved and can even accommodate families with strollers, and it goes through the villages and through natural vegetation ; Hung Shing Yeh beach; South African perlemoen (abalone) on offer at a restaurant; view from the trail as we approach Sok Kwu Wan village with its seafood restaurants where we had lunch at the Rainbow Seafood restaurant; stylish Chinese gazebo at the lookout point; the Jumbo floating seafood restaurant in the Aberdeen side of Hong Kong harbor, delivering its guests by boat. Since it’s Friday I have to post a happy picture, right? 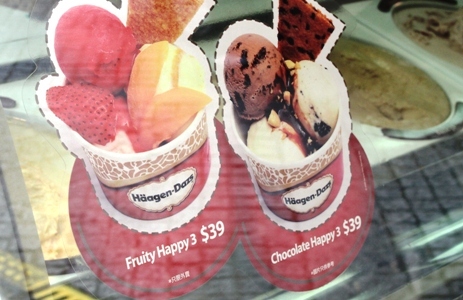 This Häagen-Dazs® ice cream store in Macau offered Fruity Happy3 and Chocolate Happy3 flavors (I’m not sure what the 3 is for). I’m just happy that it is Friday. 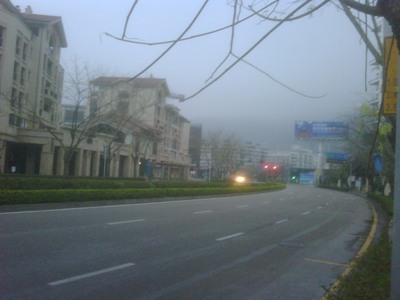 We get to go home early so that we can avoid the crush of weekend traffic back to Shenzhen. And we put enough hours in from Monday through Thursday. I still have to completely settle into my apartment and try my hand at using the washing machine for the first time. My internet connection is now working but it’s very annoying not to be able to access sites such as Facebook and even my own blog! I get around it by turning on the VPN (Virtual Private Network) software on my company computer. That way the internet servers here thinks I am logging in from the USA. The wind howled last night around the apartment corners and through the crevices, and was still blowing this morning. The wind blew any would-be morning fog away, so that the water in the bay showed a beautiful turquoise color with steep blue mountain tops in the distance. (My cell phone picture does not do it justice so I will take a nicer one with my big camera). This weekend is the Hong Kong Rugby Sevens Tournament (see http://en.wikipedia.org/wiki/Hong_Kong_Sevens), by some people billed as Asia’s biggest sporting event. While I’m not so sure that is true, it certainly is a big event for the huge expat community in the city. I am actually headed to Hong Kong on Saturday for a harbor boat trip that the company set up for us, but I’m not going to try to make it into the rugby stadium. I see South Africa is in Pool F. And hey! the USA has a team as well. Go Boks! Go USA! Should I say Go China? : ). I can now walk down to the waterfront from my apartment in the evenings which is great. I will post a few more pictures of the beach and the small marina here. A bit of a stretch to call it ‘Shenzhen Marina’ since we’re on the outlying east area outside the metropolitan area of Shenzhen ! Here’s an update for the imported steaks : the Go-go Logistics delivered the lost bag at 10pm last night with the steaks thawed but still cool – so at least they will not go to waste. I moved into my single apartment last night. It’s a little furniture-bare and the internet connection is out of order, but hey – without roommates I now have better control of my night schedule and can enjoy the peace and quiet. 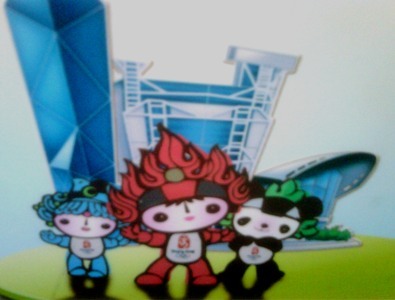 The three little superheroes – or are they more down-to-earth travelers of the Chinese imagination? 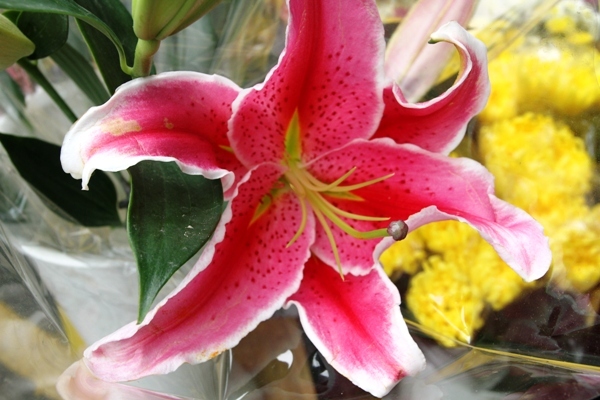 – appeared on a sticker on the ferry back from Macau. I recognize the Bank of China tower on the left behind them but I’m still trying to find out which the other two structures are. OK .. so it is possible to go too far in search of one’s food preferences while in China. It is not a good idea to buy a special freezer bag and put frozen (but raw) steaks in your checked luggage! because that would turn out to be the one time the airline leaves your baggage behind. So IF the steaks did not get confiscated by customs, they would likely be bloody and spoiled by the time it arrives in Dameisha, China ! (The bag has not arrived yet, and it wasn’t me that did that). Eat your rice, your veggies and your noodles! It’s good for you. 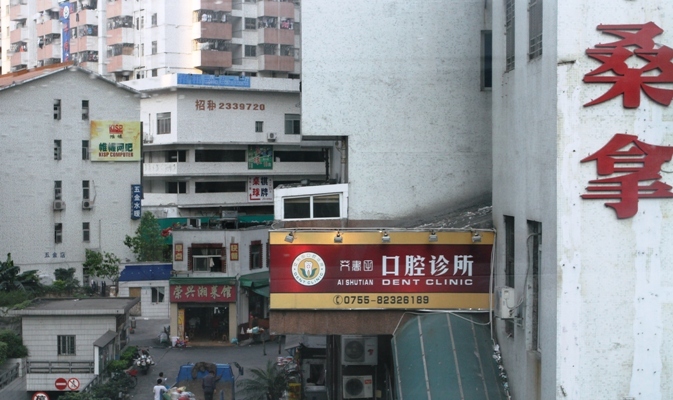 Anyone up for a visit to the dent clinic to fix up your dents? 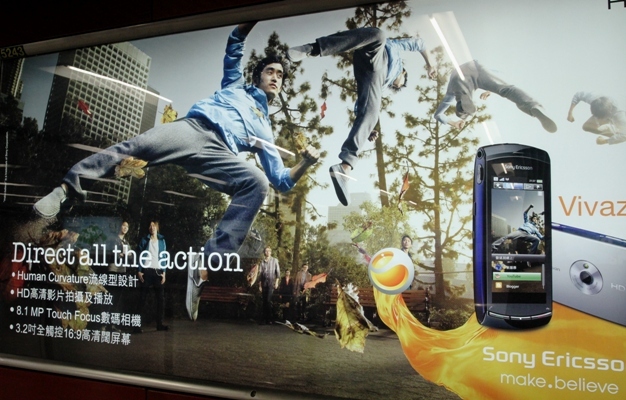 : ) .. picture taken in Shenzhen recently. Monday morning at work and I am posting a friendly picture of piggy banks I spotted in a store window in old town Macau (a good thing the shop was closed, or I would have not known which one of the piggies to pick!). It’s going to be a busy busy week at work since we’re behind schedule and trying very hard to catch up. P.S. 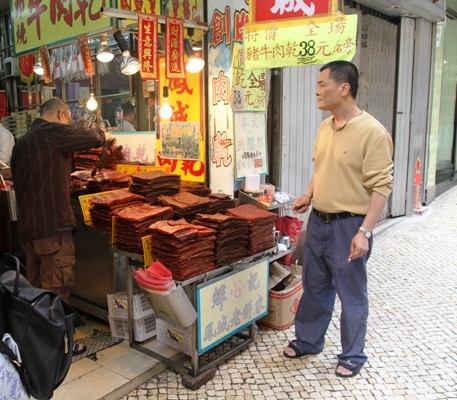 One Hong Kong dollar is about eight US dollars, so the piggies are not expensive. The ferry ride and bus ride back to Dameisha was much quicker than the way in .. but here are more pictures from the weekend. 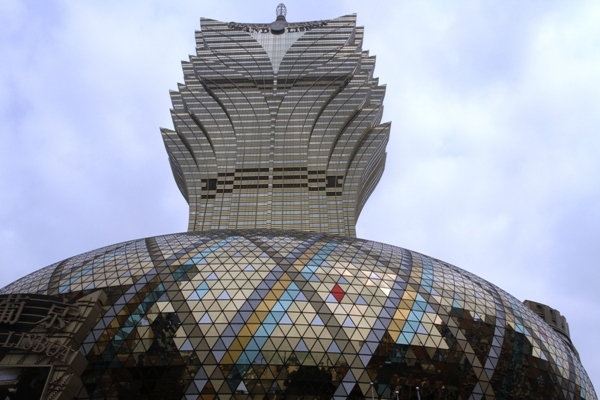 I may not have seen all the new buildings on Macau peninsula and Macau island, but the Grand Lisboa casino with its bulbous base and tulip-like upper floors is just spectacular. 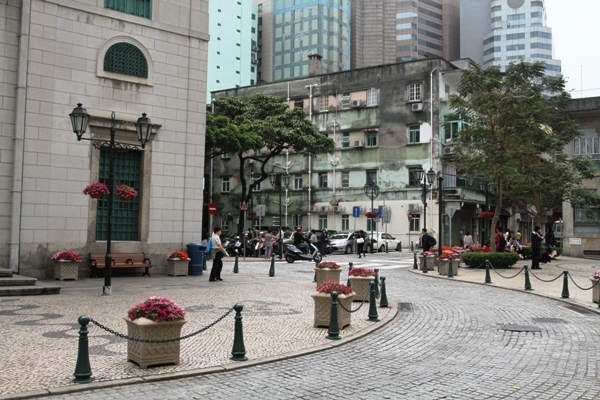 The older part of Macau certainly has its charms, but it’s not as enticing as Hong Kong; the drivers are a hazard to pedestrians and WILL NOT SLOW DOWN even if you are in the cross-walk with a group of people! and not as much English is spoken as is in Hong Kong. Next time I will go for a day trip from Hong Kong. There is even talk of constructing a causeway from Macau to Hong Kong, which will eliminate the ferries. 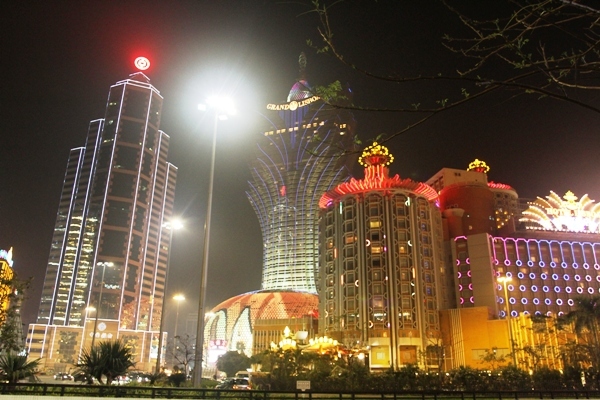 Grand Lisboa casino by day and blooming in shimmering neon and LEDs by night; the third picture shows the Grand Lisboa hotel alongside it; the building that looks like the Beijing Olympic swimming arena is an older casino; next is the opulent inside of The Venetian Macau with its football field-size gambling floors; the next three pictures are from the foyer of the Wynn : the metal artwork in the dome (the Chinese zodiac, see the rabbit, the tiger and the ox?) 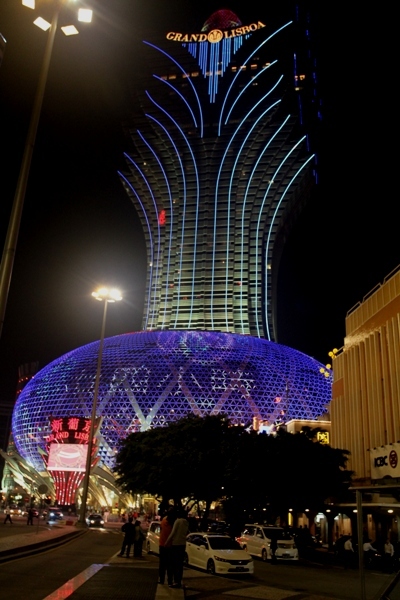 opens up like a camera shutter on the hour with a spectacular screen display, and up from below rises the Tree of Prosperity (and the spectators throw coins at it); next up is the old part of Macau, arguably with more charm than the glitzy casinos! 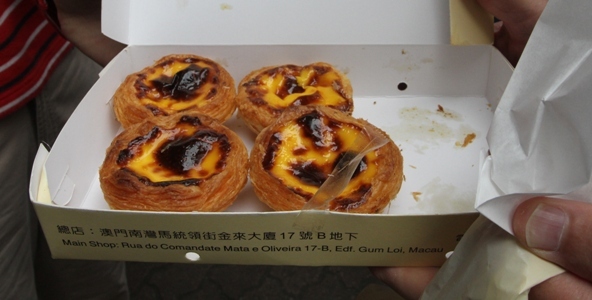 – the Ruins of the St Paul cathedral, sheets of pounded meat sold on the streets, traditional Portuguese custard tarts called pasteis de nata; cobblestone street; the A-Ma temple, one of the oldest and most famous temples in Macau, built in 1488, the temple is dedicated to the goddess of seafarers and fishermen Matsu and finally, a group picture of the Macau tourists. We arrived at 10pm Friday night on the Shenzhen-Macau ferry; this was after we left Dameisha at 4pm, so it was not easy to get here. Next time I will go to Hong Kong and take the ferry from there. 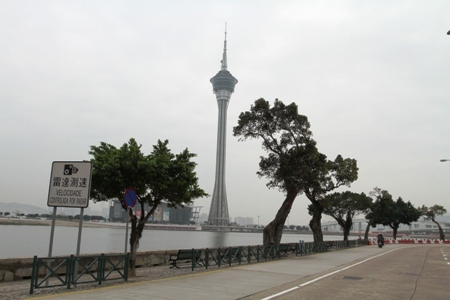 I’m posting only one of my favorite Macau pictures and will post more tonight, it’s of the Macau tower viewed from the Avenida de Republica. The tower measures 338 m (1,109 ft) in height from ground level to the highest point. There is an observation deck with panoramic views, restaurants, theaters, shopping malls and walking tour around the outer rim (we didn’t have time to go up in the tower). 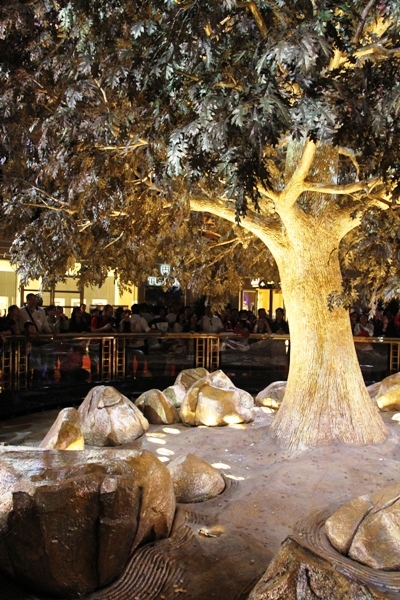 It offers the best view of Macau and in recent years has been used for a variety of adventurous activities. We saw bunjee jumping from the tower albeit with two extra guide cords that keeps the jumper from slamming into the tower. The casinos and new buildings here are just spectacular. 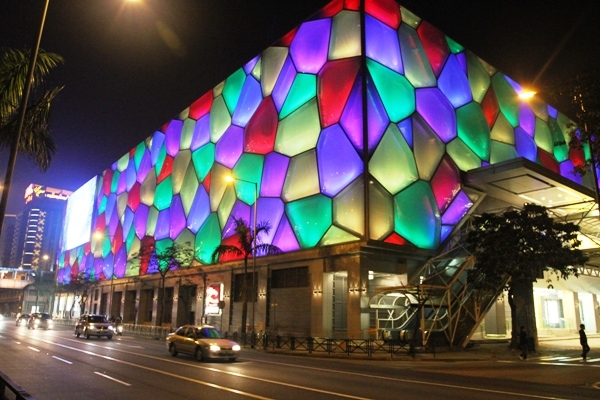 They slumber by day and come alive at night with giant neon and LED lighting and giant electronic displays. We stayed in the Golden Dragon Hotel, not quite up to the Marriott’s standard, and the beds are extra extra firm (read : very hard!) but last night I slept on top of the comforter from the second bed which worked very well. We went food-shopping at Carrefour in Shenzhen last night (the characters are from a children’s book in the store .. I’m the tired guy on the right, I think! 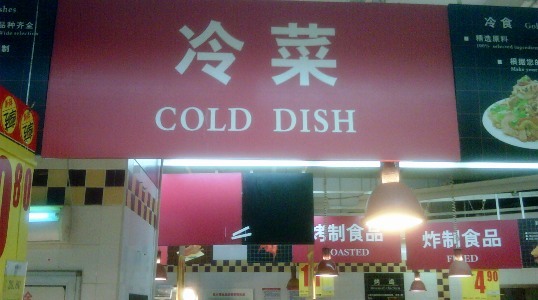 ), and the food department’s little spelling faux pas reflect the fact that in written Chinese there are no plurals. One dish, many dish, one house, many house, one sheep, many sheep (hey, that one actually works! : ). 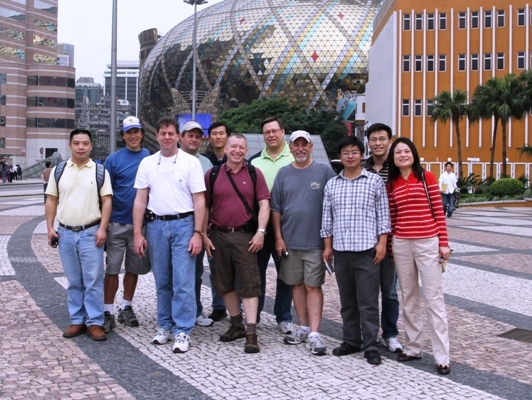 After work we’re heading out to Macau for the weekend; I hope to get some rest and just check out the joint. 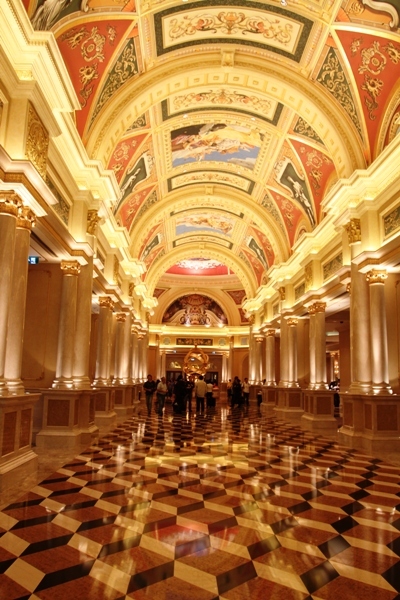 We will wander through the casinos, of course, just to see what they look like. 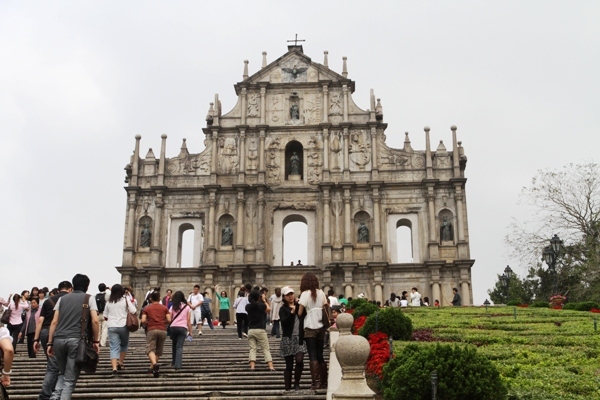 Some travel sites opine that Macau will soon overtake Hong Kong as a travel destination soon, but I will go and look for myself ! Most St Patrick’s Day partiers that went to McCauly’s Pub in Shenzhen were missing on the early bus this morning (we have an early bus and a late bus). The pub serves up a mean shepherd’s pie, I’m told, and was packed. 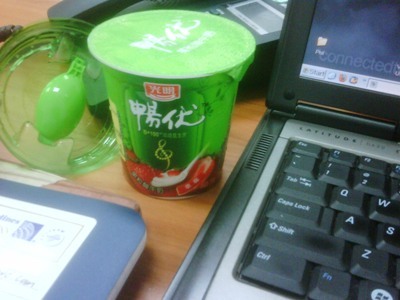 I usually finish up my breakfast at my desk (the yogurt cup’s lid has a folded spoon in, see?). 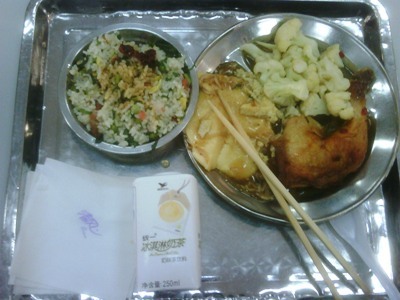 Lunch time in the cafeteria still offers up new dishes from time, such as the steamed egg below the chopsticks (it has the consistency of flan), the rest is familiar fare : chicken leg, cauliflower and fried rice. The drink is tea-flavored milk. I’m looking forward to get the blueprint phase over with so we can get busy building the new system in SAP. It’s a new version of SAP with new bells and whistles. So the SAP elephant can be made to dance a few new steps. Wednesday/ Happy St Patrick’s Day! Happy St Patrick’s Day! A group of party animals from work went in to Shenzhen to an Irish pub tonight. I was tempted to go but it’s a school night, and I had a long day of work sessions. Tomorrow is the first day I will get time to catch up on all the other work I couldn’t get to. I also have to pack my things : I am moving to a single apartment. It will be great to have a little more space and a quieter time in the evening and on the weekend away from my two roommates. I still check out all the grocery products, foreign and well-known brands, in the little store here at the apartment complex every time I go there. So in the spirit of St Patrick’s Day (the Irish and potatoes), here’s three Chinese flavors of Lay’s chips not found in the USA : cucumber, blueberry and .. American classic flavor ! 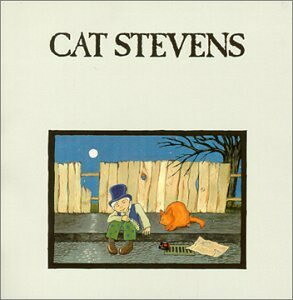 Tuesday’s Dead is the name of a song on Teaser and the Firecat, an album released by Cat Stevens in 1971. It’s the floormat with Tuesday on it in the elevator of our building that made me think of it. A lot of work it is, to change out the floormat every day of the week, not? And is the week such a blur that the office workers need reminding that today is actually Tuesday? 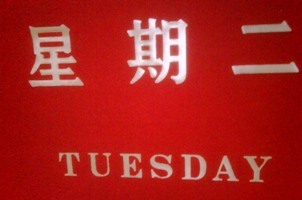 : ) And why does 星期 二 translate to Tuesday? Well, it’s ‘small period of time, the second’. I didn’t do too badly sleep-wise last night, but I am still tired. So off to bed with me.